I can trace my life as a food lover through various milestones: the first time my father took me to a sushi bar, the first chicken foot I tried at a dim sum restaurant, my first taco de lengua. Similarly, pho has a special place in my heart (and my stomach). Pho is completely unassuming; a bowl of humble noodles, cheap cuts of meat, and a clear broth. Yet, it’s so much more. Pho is a testament to the power of cooking, of transforming simple ingredients into something beautiful. My first bowl of pho in Vietnam is everything I had hoped it would be. The broth is rich, made spicy by the addition of fish sauce studded with big pieces of bird’s eye chili. The noodles are fresh and perfectly cooked and the chicken is tender. Quartered limes add acidity, brightening the dish. Everything comes together just as it should. I am certain, at this moment, that no one in the world is eating better than I am. Something happens as I eat that foreshadows my experience traveling across Vietnam. I’m sharing a little plastic table with a middle-aged man in business clothes. He looks at me and gestures to his bowl. Before I can react, he stands up and walks over to a bag filled with fried bread and brings me a piece. I hadn’t realized that it was part of the meal. The man nods in approval as I start to eat it, seemingly happy that I am now getting the full experience. Chance encounters like this end up defining my trip. People I meet in Vietnam have a profound eagerness to share their food. They are clearly immensely proud of their culinary traditions. 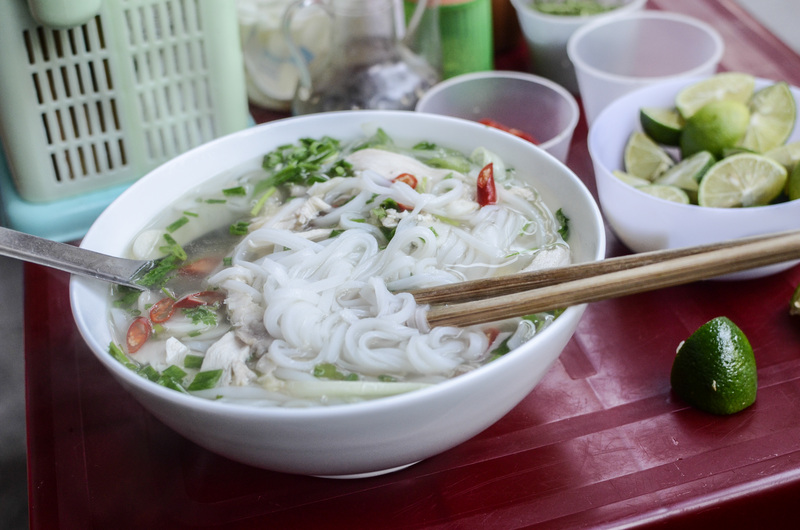 I find good things to eat everywhere I travel, from pho ga in Hanoi, to bun bo in Hue, to banh canh in Saigon. I could spend my whole life exploring this country, one meal at a time. This entry was posted in Uncategorized and tagged asia, food, hanoi, pho, travel, vietnam by rabonour. Bookmark the permalink.